Ever feel like your friends are more foe? 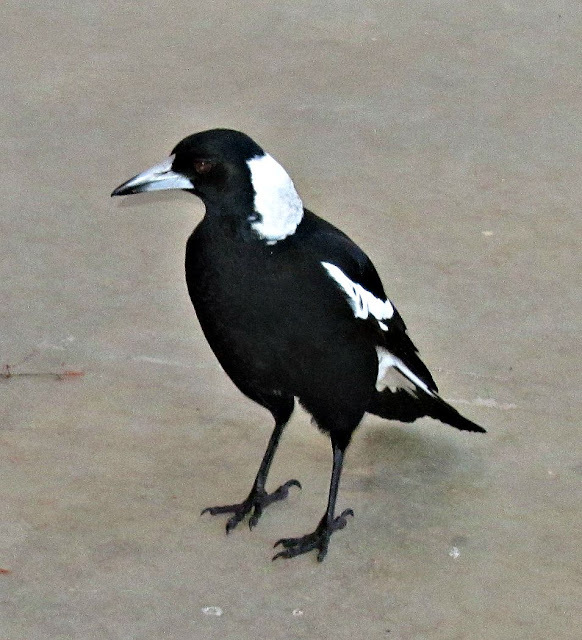 We've always had a very friendly relationship with the magpies around our place. They don't swoop us during nesting season and we don't hunt them away when they poop on the back deck. They come to our windows and serenade us of a morning and we let them take refuge on the front balcony when it rains. They show off their babies to us in spring and Derek lets them walk behind him when he's mowing the lawn so they can get the grubs that have been disturbed by the lawn mower. It's been a decent friendship - until now. This weekend we discovered that one of our resident Maggies has taken to ripping up the lounge chair on the front balcony to pad his nest. It started with him removing a single stray thread and has progressed to completely destroying it. We've tried to shoo him away. We've made it clear it's not OK. He just looks at us with his head cocked to the side and says "but I thought we were friends?" He's taken advantage of the friendship. At what point is it time to declare the friendship toxic and move beyond it? It got me to thinking about human to human relationships and what I would do if a friendship started to get too heavy and one-sided. How do we know when it is time to end it? Recognise it's toxic: Identifying the issue is the first step. Take responsibility: If we are continually being taken advantage of and it's making us unhappy, then more fool us. Take control of the situation. Communicate and set boundaries: Recognise when a line has been crossed and make the friend aware that it's not OK. Create a barrier: Making ourselves less available (erecting a barrier) is one way to take a rest from the situation until everyone can get their minds around what is happening and find a solution. Seek advice: Talk to non-toxic friends about what is happening to get an objective opinion. They may be able to give advice while at the same time help neutralise the situation. Suggest professional help: Depending on the situation it may be that the friend is in need of some professional care. Their toxicity may be coming from a troubled space. End the friendship: After everything is said and done, if the friend doesn't hear what is being said nor think there is a problem with their actions, it might be time to break up. Or at least widen the gap and create some distance. As with anything in life we can press 'stop' ... or even the pause button to allow some time to pass. When it comes to Maggie I've definitely identified the problem and made a decision that I don't like it. We've tried to chat to him but he's just not listening. So now it's time to put up a barrier in the form of covering the couches with a sheets and tying them down to ensure he can't have access. We've already started chatting to people about it and they've offered advice. We may have to talk to some wildlife experts to see how we can stop Maggie's behaviour while not losing his friendship in the process. I guess the bottom line is we'd like to remain friends with him instead of starting an all-out swooping war. But if he continues his bad behaviour, we might have to ditch him. Damn you Maggie! We've been friends for such a long time. Have you ever had to end one? Have you ever seen a magpie make a nest out of a couch? Duct tape - LOL. The hill billies furniture fix ... it's worth a shot I suppose! Eek on the magpie! Great advice on the crap friends! It almost looks like the poor couch is bleeding. That's definitely crossing the line. Thank goodness they sing so sweetly!! I'd put something over it so Maggie can't get to it. On the friend front, I've fortunately never had to break up with any 'good' friends, but I've definitely let others fizzle. The good thing about moving (away) is that you just become FB friends and then at some point you defriend them and they probably won't even notice! I stopped talking to a few old friends last year. I don't like to lose friends but my life is nicer without them. I remember being attacked by magpies as a child every time I walked to school! And yes, I've had to walk away from friendships a time or two. It hurts but is always better at the end of the day. Argh magpies don't make good friends. But they make worse enemies! Oh this was equal parts charming and thought provoking Leanne, so well done on that. I would be a little sad about the couch as well. It's a pity you can't reason with birds. There was a point where I thought he was listening because he hopped away. But he was bluffing. He was back the before I'd even gone back inside the door. Love this story (not what has happened to your couch though) I've had to call time on a toxic friendship this year, am still pleasant but the barrier is definitely in place. Yeah, I think you can be friendly with people without having to be friends. The magpies here have a habit of biting off my pot plants on the pergola, just when they are looking their nicest, so all I am left with is a little stalk. It doesn't matter if it's a brilliantly blooming begonia or a succulent (non prickly) cactus - snip snap it goes in their beaks - grrrr. Definite friendship ruining behaviour that! I don't know too much about toxic friendships but I have a lot of experience with toxic family members, and I think your advice is spot on. It's just harder with family because of the whole "blood is thicker than water" myth. Balderdash ... it's self-care. Having people like that in your life is bad for you. I wonder why they take your flowers? What would they be using them for? Interesting.